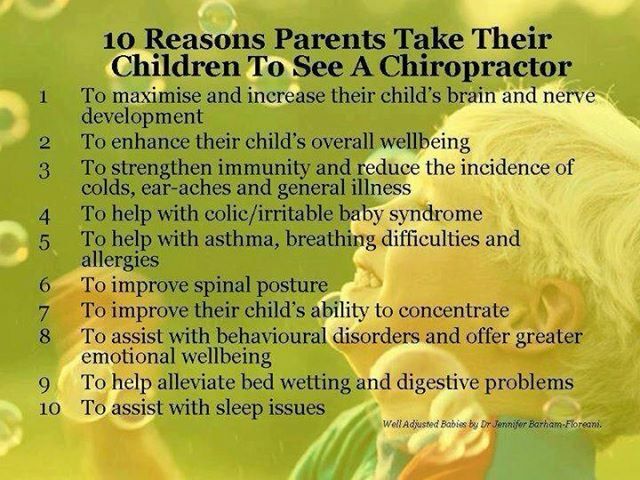 Chiropractic is safe for kids. Dr. McVay has been adjusting her own children since they were babies. She has adjusted many children from infants to teenagers over the past ten years with wonderful results. Sometimes children can have the same kinds of spinal complaints that adults have such as neck pain, back pain, or headaches. These complaints are often related to a fall or injury of some kind. Dr. McVay also treats a number of athletes from the surrounding schools. Correcting spinal subluxation helps the nervous system to function at its best. Some nervous system dysfunctions common in newborns and younger children include colic, poor appetite, breathing problems, and chronic ear infections.